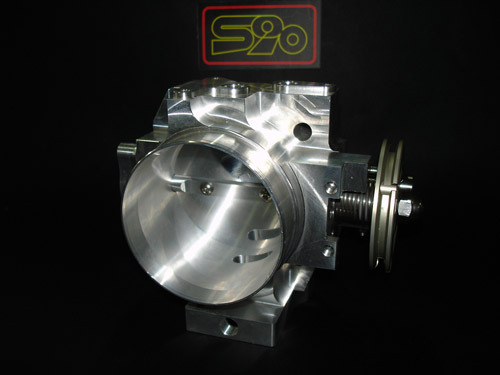 Designed by S90, These series of direct bolt-on throttle body are precicion CNC - machined from AL6061 - T6 billet aluminium and hard anodized for increased durability. The throttle shaft and blade assembly are made from AL7075-T6 seprately to increase horsepower and torque by optimizing airflow to your engine. With a Larger Oversized Throttle Body, you can supply as much Air as the Intake Manifold demands. Whether you have a set of Aftermarket Cams, Supercharger, Nitrous or Turbo, Oversize Throttle Bodies will deliver More Horsepower! Oversize Throttle Bodies work well with Fuel and Air Upgrades. Use of a High Flow Air Intake is required, as the opening is larger than the Stock Intake Piping. Match Porting your Intake Manifold will help Maximum the Larger Throttle Body Diameter. Authentic S90 product. Includes a 1 year manufacturer warranty against any defects. Want this item shipped out today, April 22? Order within the next 4 hrs 36 mins.